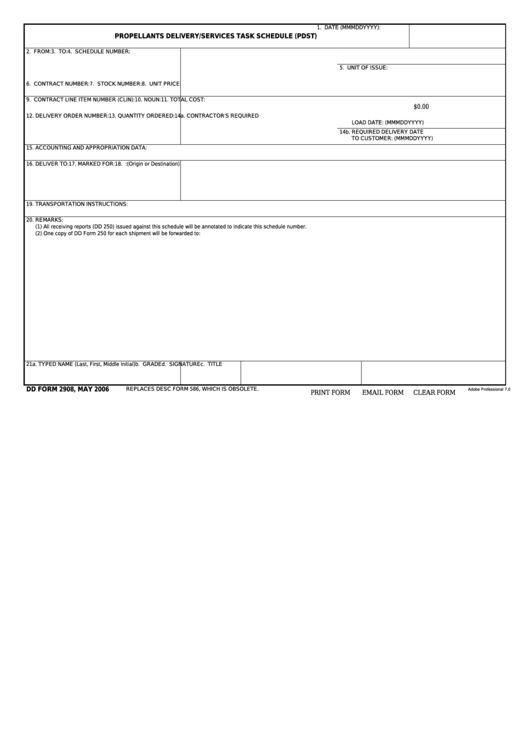 Download a blank fillable Dd Form 2908 - Propellants Delivery/services Task Schedule (Pdst) in PDF format just by clicking the "DOWNLOAD PDF" button. Complete Dd Form 2908 - Propellants Delivery/services Task Schedule (Pdst) with your personal data - all interactive fields are highlighted in places where you should type, access drop-down lists or select multiple-choice options. (1) All receiving reports (DD 250) issued against this schedule will be annotated to indicate this schedule number. REPLACES DESC FORM 586, WHICH IS OBSOLETE.